You know how there are all those posts this time of year telling us that it’s okay to say no to stuff we don’t want to do? Because we need to make room for joy and all that? Well, I’m already really good at saying no. My whole world is a no. 😉 Most of that is because I’m an introvert married to an introvert and we are a united front of no. Social obligations don’t stand a chance between the two of us. But one thing we both like during the holiday season: Sending out our annual Christmas card (dubbed WFCFL) with a photo. Because we also enjoy getting that kind of mail. It’s fun. It gives you a chance to see what family and friends are really up to, sans the Facebook shine. How much the kids have grown this year. Who went where on vacation. You know, the important things in life. No recycled holiday paper, no seeded paper to be had locally … so this was the next best option. Pre-project, I didn’t think much about this. I’d order a photo card off of a website, crank out a letter, and maybe toss it into an envelope with one of those self-stick tabs if that’s what Eric had bought the last time he was in The Store That Must Not Be Named. Everything came shrink-wrapped. That’s just the way it was. This year, Eric and I have given a lot of thought to our WFCFL. We didn’t want to give it up, but we also didn’t want to just do what we always do, which is accept that this isn’t a low waste project and go about our day. I really, really liked the idea of seeded recycled paper for our letters as suggested here in the comments. I went online and looked at options. Then I went into town and checked out what we had locally. I asked specifically for seeded paper or recycled paper. No seeded; very limited recycled paper, and nothing with a holiday theme. (No biggie, I’ve got an artist in the house.) Most of my choices were plastic-wrapped papers; I could get single sheets of paper at 40¢ each at the local stationary store, but we send out 50-60 cards and I wasn’t prepared to make that kind of a financial commitment. Ordering paper online — seeded or recycled — also seemed a bit wasteful, just in the packaging of the product (I did find one that was in paper) and in the mailing of it (more boxes, more packing, more gas miles). And it wasn’t very cost efficient, either. Back to the local stationary store. 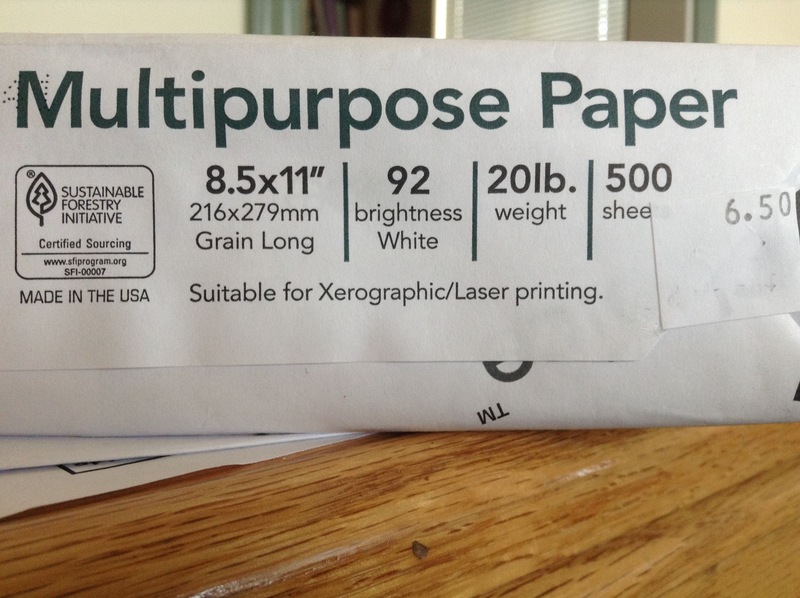 My choices: A $14.99 package of 100-precent recycled multipurpose paper, or a $6.50 package of “Sustainable Forestry Initiative” copy paper, both wrapped in paper, both made in the USA, both 500 sheets. I’m cheap, you guys. I went the $6.50 route. But I accidentally made a really great choice. Reading up on the Sustainable Forestry Initiative, I learned this is an Oregon program focused on forest management. And the quality is great. Then I printed one letter, asked Johanna to doodle Christmasy stuff around the edges (she chose to draw lights), and then made copies from that. So that’s the WFCFL. The photo was another ordeal. 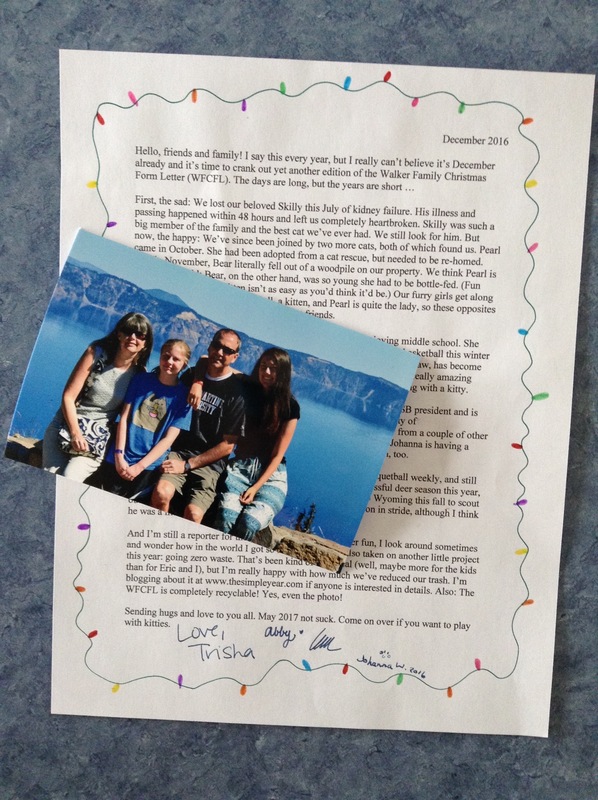 We decided to forego making a photo collage online and just send a family photo. Eric chose one, put it on a USB drive, and took it to one of those variety stores that are not The Store That Must Not Be Named. Dear friends and family: Seriously, recycle this whole ordeal. We decided to get 50 prints this year to further cut down on waste. And then Eric came back all sheepish, like, I could get individual prints for 39¢ ($19.50 total) OR they had this special where if you ordered 75, they were 15¢ apiece ($11.25), so I went with the 75. I know that’s not very zero waste. But hey: Thanks to Earth911, I know “modern” photographs are recyclable because science. (Lack of chemicals in modern prints, basically.) Awesome. But yeah, we didn’t need 25 extra photos. Partial credit only. But! I think we did pretty well on the zero waste front — we’ve got a 100 percent recyclable (if maybe a little boring) product (which I even explained in my letter and asked everyone to recycle). Cross this year’s WFCFL off the to-do list! Anyone else send cards in December? Did you make any zero/low waste concessions this year? Next up: Random update time. This entry was posted in zero waste and tagged getting off a mailing list, holiday cards, recycle, zero waste. Bookmark the permalink. I’ve just ordered the photograph that my son had taken at school (this normally happens annually in the UK). I wanted one large one to keep and 3 medium ones for relatives – this came to about £60! So instead I ordered one of the standard packs, which gave me one large, 4 medium, 8 small, and a bunch of passport size ones plus bookmarks, all for £30. Crazy. No idea what I’ll do with the excess. This is a pet peeve of mine, actually — having to buy more to get a reduced price. It is crazy. I bought used cards at the thrift store (they haven’t been used, but someone donated them). I plan to write in them, send a picture if my husband catches me not sending a picture. I’m feeling pretty guilty about not writing my cards yet, but apparently I can live with that level of guilt. Oh, that’s a great idea! I never remember to visit the thrift shops in town (they kind of scare me). When I think “thrift” I think “Goodwill,” which is in the next town over. I have no idea why. If it makes you feel better, last year I started addressing cards on Dec. 23. Part of that was because our photo card got delayed by the online company for some reason, but most of it is because I just don’t traditionally do well over the holidays. I’m trying to be good this year! I have several ancient Christmas cards left over from many past years so that is what I am using – at least the ones that still have envelopes. I think family photos at Christmas is an American thing – I am Canadian and we neither send nor receive family photos except from my American relatives although I don’t know – maybe some Canadians are now adopting the habit? Oh, funny — I had no idea that was an American thing! Not everyone here does it, but I bet 90 percent of all holiday cards we receive have a photo. I like the “less is more” approach. I may suggest that for next year! That’s awesome that you get to stay home — because we use each other for moral support, any time one of us has to go somewhere, we drag the other along. Eric recently was asked to drive a van in a parade … and he said sure, if I could go. (Gee, thanks, darling!) Luckily we don’t often have those kind of events! We have sent photo cards and a newsletter every year since having kids and I actually like to do it! I do complain about coming up with ideas on how to write a “fun” newsletter, and my husband tells me to skip it, but I enjoy the process once I find my idea. I’ve sent cardstock photo cards for the last few years which I’ve bought online, usually with a great coupon code. Last year I had a bunch of colored paper my parents gave me and took it to a copy store to copy my letters on. This year I didn’t have time to do that, so I just printed a Christmas-related watermark on my letter and called it good. I know most people won’t keep the card after Christmas, so I do hope it gets recycled, since its cardstock! Will have to think on how to make it more zero-waste for next year. At least we try and hand them out to most of our friends in person, so we can save on stamps/gas that way. Sounds like you were fairly low-waste this year! Yay!